Hundreds of volunteers of all ages from throughout South Palm Beach County’s Jewish community fanned out across the area in their special T-shirts on Monday, January 15, 2018 to make a difference for those in need at nearly 20 hands-on projects. Whether the volunteers packaged food for the hungry, prepared birthday kits, gardened, refurbished shoes, played games with seniors or much more, all were inspired and energized by joining with the full vibrant diversity of their Jewish community in helping their less fortunate neighbors. With PJ Library® at Bedner’s Farm, children and families enjoyed learning about mitzvot through storytime and crafts, brought new pajamas for children in need, and picked strawberries for donation, among other activities. Held on Martin Luther King Jr. Day, the second annual Jewish CommUNITY in Action Day was again presented by the Jewish Federation of South Palm Beach County and its Deborah and Larry D. Silver Center for Jewish Engagement (CJE). 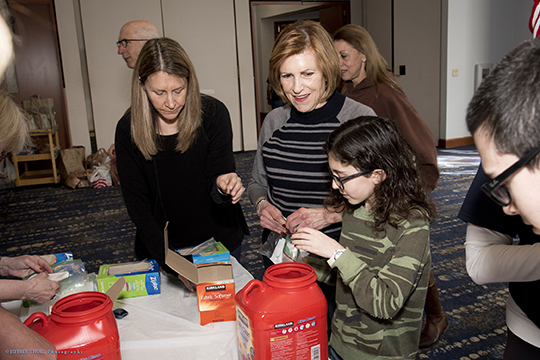 This year, the daylong event was dedicated in loving memory of Dr. Yoram Dahav, who inspired generations of students to pursue tikkun olam (repairing the world) throughout their lives. Jewish CommUNITY in Action was generously sponsored by Hotwire Communications. The Florida Jewish Home was the event’s newspaper sponsor. For more information about the Center for Jewish Engagement activities, contact Rabbi Josh Broide at joshb@bocafed.org.